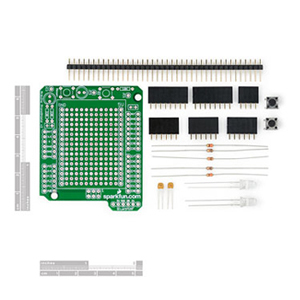 New Products: gyros and compasses and Arduinos, oh my! We’ve just added a bunch of Spark Fun products to our catalog! We are now proud resellers of the massively popular Arduino, and a bunch of other cool stuff! Riding on the waves of the very popular Arduino USB board is this small prototyping shield. 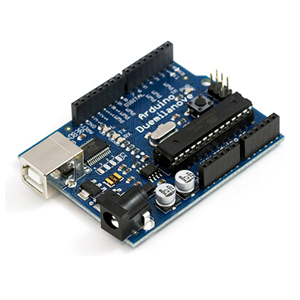 The Protoshield mates with the Arduino USB board and gives the user a small soldering area, two general LEDs, access to a BlueSMiRF socket, a general pushbutton switch, and most important of all – the Arduino reset switch is brought to the top level. Are you an aspiring meteorologist? This USB weather station can immediately tell what the current pressure, humidity, and temperature is. Graphed over time you can watch weather fronts move in and the rain come down. The OS5000-S is an extremely small form factor (1×1â€? square) three axis, tilt compensated digital compass. The flexible design allows customers to use RS232 Serial connection for system integration. The OS5000-S provides precise heading, roll and pitch data ideal for rapid attitude measurement. The compass offers an easy to use ASCII interface which includes hard-iron calibration and simple data configuration for your application. Breakout board for the Analog Devices accelerometers in the E8 package. 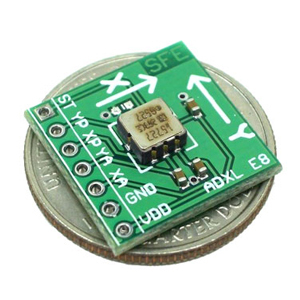 The ADXL is a solid state MEMS accelerometer with digital PWM or Analog output. The ADXL can measure both static and dynamic acceleration. This means the ADXL is suited well for sensing tilt (used in many Glove / Air Mouse applications) and for sensing brute acceleration (rocketry and general motion sensing applications). Ever hear of a thing called RGB? Red, Green, Blue? How about an RGB LED? These 5mm units have four pins – Cathode is the longest pin. One for each color and a common cathode. Use this one LED for three status indicators or pulse width modulate all three and get mixed colors! 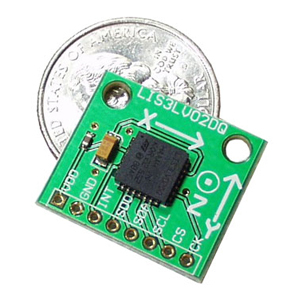 The SerAccel v5 is a 3 axis accelerometer up to +/-6g with a simple serial interface. This is a simple breakout board for the Melexis gyroscope featuring both analog and digital (SPI) interfaces. 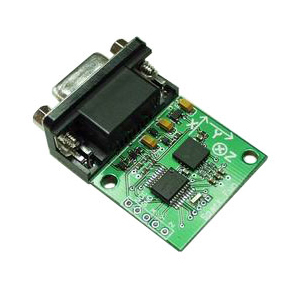 Designed for dead reckoning navigation applications, the MLX90609-E2 is a 150 degree/s max rate gyro with low drift and programmable bandwidth, this gyro is perfect for digital stabilization and control. This is a simple breakout board for the Melexis gyroscope featuring both analog and digital (SPI) interfaces. 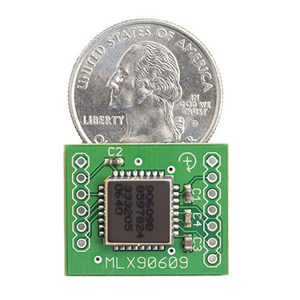 Designed for dead reckoning navigation applications, the MLX90609-R2 is a 300 degree/s max rate gyro with low drift and programmable bandwidth, this gyro is perfect for digital stabilization and control. 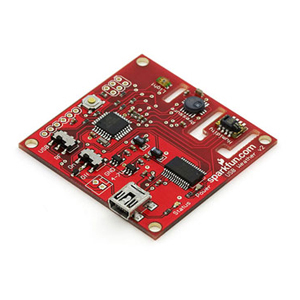 EasyDriver v3 is a simple to use stepper motor driver, compatible with anything that can output a digital 0 to 5V pulse. 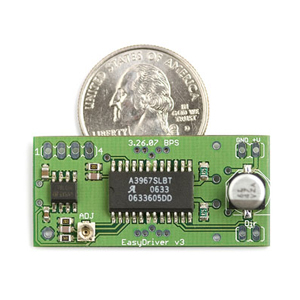 The EasyDriver requires a 7V to 30V supply to power the motor, and has an on board voltage regulator for the digital interface. Connect a 4-wire stepper motor and a microcontroller and you’ve got precision motor control! Breakout board for the 3 axis MMA7260Q accelerometer from Freescale. With a low power shut-down mode, high sensitivity output with selectable ranges (+/- 1.5, 2, 4, and 6g), this sensor is one of the very first to market with three accelerometers sensors built onto a single IC! Board comes fully assembled and tested with external filters installed. Breakout board for the 3 axis LIS3LV02DQ accelerometer from ST Micro. With a digital interface (SPI or I2C), the user only has to initiate commands to get 1mg resolution! Independent channels can be shut off, the sensor can be powered down, even an interrupt threshold can be set and used to awaken the sensor from power down! Selectable ranges are available for +/-2g and 6g. 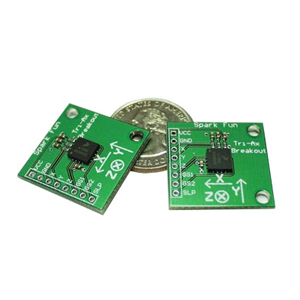 This sensor is one of the first with triple axis and an easy to use digital interface. Board comes fully assembled and tested with external decoupling caps. 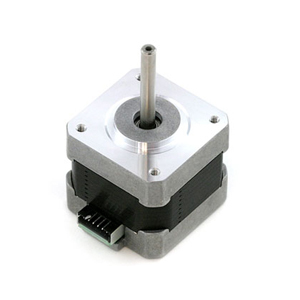 This is a simple, but very powerful stepper motor. There you have it, folks. If you like what you see, click the links, read some manuals and spec sheets, and buy things. As always: if you have questions, feel free to drop us an email, post in the forums, or if it’s an emergency and your leg is going to fall off if you don’t find out what the difference between an accelerometer and a gyro is RIGHT NOW, give us a call.